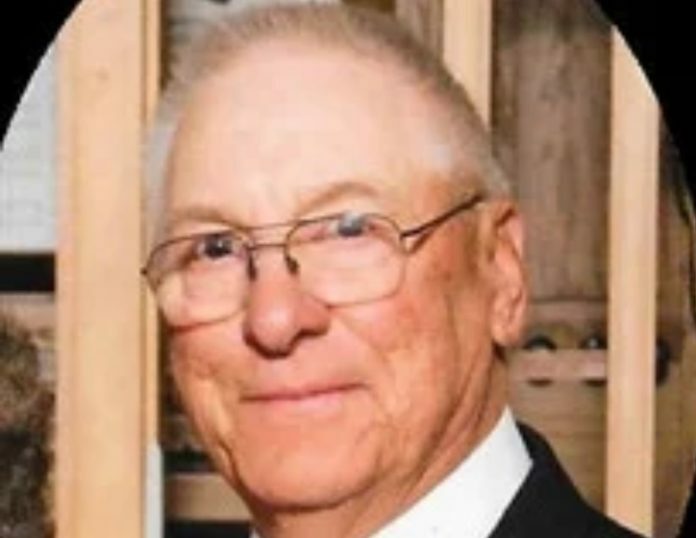 Funeral services for Lyle Robert “Bobby” Heater, 83, of Rippey were Friday, Feb. 1 at 10:30 a.m. at Hastings Funeral Home in Perry, with burial at the Rippey Cemetery. Visitation started at 1 p.m. Thursday at the funeral home, with the family present at 6:30 p.m. and a time of sharing at 7 p.m.
Pastor Paul Burrow of the First United Methodist Church in Rippey provided words of comfort. Honorary bearers were Hugh Gannon, Mark Gannon, John Gannon, Rick Gannon, Dennis Ulrich, Dale Thompson and Dale McDonald. Casket bearers were Ashley Bebb Walker, Austin Bebb, Alex Bebb, Nicholas Wilkening, Zach Wilkening, Noah Wilkening, Patrick Mead, Mark Heater, Michael Mead, Michael Borgeson, Robert Borgeson and Alan Borgeson. Pianist was Elta Summerson, and Ashley Bebb Walker was the soloist. The song chosen was “I’ll Fly Away.” Military Honors were done by the Camp Dodge U.S. Army Detail. Interment took place at the Rippey Cemetery. Following the services at the cemetery, a luncheon was served at the First United Methodist Church in Rippey. Lyle Robert “Bobby” Heater, the son of Robert Lacey Heater and Vera Stella Anschutz Heater, was born Nov. 18, 1935, at home on the farm in Rippey, Iowa, and died Jan. 24, 2019, at his daughter’s home in rural Perry, Iowa, where he had been lovingly cared for by family and Hospice. Bobby attended Rippey Consolidated Schools and graduated from Rippey High School in 1953. He was drafted into the U.S. Army in July 1958. He served until his honorable discharge in April 1960. Bobby and Marilyn Alice Mead were united in marriage Aug. 5, 1962, in Knoxville, Iowa. Marilyn was a school teacher and quickly adapted to being a farm wife. The couple was blessed with two daughters, Teresa and Michelle. Bobby always loved being a farmer. It defined him. He raised corn and baled tons of hay for his large cattle herds and hogs. He loved his baby animals. Bobby was pleased with his well-earned reputation for planting straight rows, no matter if in the field or in his gardens. Bobby was proud of the fact he never retired. Even when enduring cancer and treatment, he faithfully trucked almost to the end. Bobby was a strong Iowa Hawkeye fan. He and Marilyn would travel in all kinds of weather for a basketball game. Bobby would go to football games with Bill. The Heater siblings would often meet at game sites over the years to enjoy each other’s company. He was also a lifelong Cardinal fan. He enjoyed gambling in Las Vegas, at Wild Rose, Prairie Meadows and Tama. Bobby and Marilyn took several trips to Branson for well-deserved breaks. He was a former member of the Masonic Lodge in Rippey. Bobby was preceded in death by his parents, Robert and Vera Heater; granddaughter, Amber Bebb; parents-in-law, Roger and Helen Mead; sister-in-law, Dolores Heater; brothers-in-law, Jack Carlisle and Carl Killam; and sister-in-law, Donna Mead. Bobby is survived by his wife of 56 years, Marilyn Heater of Rippey; daughters, Teresa (Robert) Bebb of Perry and Michelle (Steve) Wilkening of Perry; six grandchildren, Ashley (Ezra) Bebb Walker, Austin Bebb, Alex Bebb, Nicholas (Meghan Knutson) Wilkening, Zach (Danielle Olson) Wilkening and Noah Wilkening; four great-grandchildren, Addison Walker, Zane Walker, Sophia Wilkening and Madelynn Wilkening; brother, Bill Heater of Rippey; sisters, Donna Carlisle of Perry and Kathy Killam of East Moline, Ill.; brothers-in-law, Larry (Rachel) Mead of California, Richard Mead of West Des Moines and Harold Mead of West Des Moines; nieces; nephews; other relatives; and many friends.